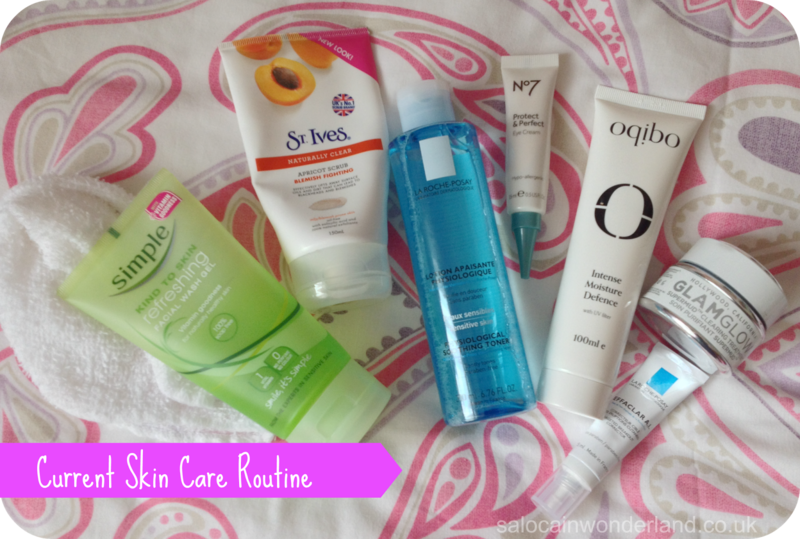 Oh wow, I can’t remember the last time I actually did a skin care routine post! I’m pretty sure I’ve only done one so far in the history of Saloca in Wonderland! Things have changed a little since that post so let’s just jump right into it! My skin is oily/combination with some mild to moderate adult acne. Since January I’ve been making a point of going outside of my skincare comfort zone and trying new products. I was once of the mindset that using new products would make my skin worse, not better so I was very cautious when it came to the products I would reluctantly try. Blogging and a little knowledge have changed all that and now I’m much more open to trying things I would have normally ran screaming into the hills away from. I’ve been cleansing in the morning with Simple Kind to Skin Refreshing Facial Wash Gel and a Washi hot cloth. All I’m removing is products applied from the night before and whatever sweat has built up as I’ve slept so I don’t need any harsh, in depth cleansers at the start of the day. Next up, I apply La Roche-Posay Physiological Soothing Toner with a cotton pad in circular motions all over my face and neck. Toners have come a long way over the years and some, such as this one, are not as bad for oily skin as they once used to be! I then apply La Roche-Posay Effaclar Duo+ to my t-zone and jaw line. This has really helped control oil production without drying out my skin. I’ve noticed a huge difference in breakouts, as in they’re very few and far between since using this! If I do have any spots popping up I use the La Roche-Posay Targeted Breakout Correcter. I dab the tiniest amount onto the offending spot and it really helps to clear it up without drying out my skin like these types of creams usually do! For my eyes, I use No7 Protect & Perfect Eye Cream. I’ve been using this for a couple of months now and I love it. It’s easily absorbed, not greasy at all, and takes good care of the delicate skin around my eyes! Can’t ask for more than that! Finally I finish up with Oqibo Intense Moisture Defence. I use the smallest amount of this during the day as it’s really thick and I don’t want my skin getting that greased up like a frying pan look! Smoothed along my neck and face then job done! Right now, the only thing that changes of an evening is my cleanser. I alternate between using my Clarisonic Mia 2 with my Simple Kind to Skin Refreshing Facial Wash Gel or, I use a scrub. I’ve been using a couple of different exfoliating scrubs lately, alternating quite a bit because I can’t settle on one right now. I still find myself going back to my trusty St.Ives Apricot Scrub but I’ve also been using Elemis and Oqibo scrubs. I use a little more of the Oqibo Intense Moisture Defence of an evening than I would in the day time. This really helps to repair any environmental damage caused during the day! I cover my lips in Aloe Vera Vaseline and the job is done! Once a week I use Glam Glow Super Mud face mask too (review coming soon!). I've been using this since April and it's amazing! I love The Body Shop Ionic Clay Mask as a more affordable alternative. Both are brilliant for deep clearing the pores and removing excess sebum. Great for oily skin! Right now I’m pretty happy with this routine, my skins been in a good place the last few weeks and I don’t want to do anything to upset that! My evening routine needs some work and there’s a few bits and pieces I’m looking into trying, so as soon as anything changes you’ll be for the first to know! Do your AM and PM routines differ much? Let me know in the comments below! I've got a confession. My skin care routine is horrible. It's a miracle if I take my makeup off at night haha. Haha what are you like! Even if I've come in blind drunk (shhh!) I still manage to sort my face out, I don't know how when I can't even get into my pjs in that state, but my face is always sorted out! I think I've crossed the line into obsession lol!